Any hopes that our recent three-game winning run pointed towards a charge towards the play-offs were dashed in last week’s 2-1 reverse against Scunthorpe United. The pattern for this season seems set, we tend to win when we take the lead, we tend to lose when we fall behind, we go on winning streaks, we go on losing streaks. It makes little sense to get too carried away when we win, but neither does it warrant an existential crisis when we lose. As predictable as last week’s loss at Scunthorpe was, it would be silly to deviate much from what was so recently a winning formula. In particular, the front pairing of Conor Chaplin and Jordy Hiwula seems to set the tone nicely for positive and energetic football, bringing in Jonson Clarke-Harris after an admittedly good showing from the bench last week is probably the greatest risk to the balance of the team. The biggest fitness concern this week surrounds Liam Kelly – who reportedly sustained all manner of injuries and illnesses to keep him out last week – can return to the side. Michael Doyle’s rusty showing last week highlighted just how much more dynamic Liam Kelly presence in midfield makes us. If Kelly is out, this may be at last be the opportunity for one of our most vaunted summer signings, Abu Ogogo, to make a belated impact on the side. The addition of the maverick Wolves loanee Bright Enobakhare this week boosts our attacking options. Jordan Shipley’s place in the side would appear most at risk as a result of this new signing, despite Enobakhare having played most of his football in a wide right position. While there are murmurs about his lack of application or end product, Enobakhare could be the injection of further attacking pace and creativity required to move our threat level up a notch. It seems likeliest that any impact Enobakhare will make on this game will be from the bench. Our last meeting with AFC Wimbledon – back in August – was the nillest of 0-0 draws. A Sky Blues side still adjusting to a raft of new signings trudged around disjointedly against a toothless AFC Wimbledon. Neither goalkeeper was particularly troubled over the course of the 90 minutes, with only Junior Brown’s late kamikaze tackle in the penalty area that was somehow waved on by the referee threatening to break the deadlock. Having run out of steam under the management of a former club legend in Neal Ardley, AFC Wimbledon have turned to another former club legend in Wally Downes to get them out of the relegation mire. A member of the original ‘Crazy Gang’ side and with plenty of coaching experience in the Premier League and Championship, this still looks very much a nostalgic appointment, with Downes’ previous managerial stint, at Brentford around 15 years ago, pretty underwhelming. Performances and results have picked up under the new manager nonetheless, with just one loss in their past five games – and that one defeat being away at league leaders Portsmouth. Downes has attempted to rebuild confidence, while promoting younger players ahead of underperforming senior pros. While they are still five points adrift of safety, AFC Wimbledon seem to be heading in the right direction. Due to injuries in attack to target-man James Hanson and leading goalscorer Joe Pigott, former Ghana international Kwesi Appiah is pretty much the only senior striker available to AFC Wimbledon at the moment, fortunately, his form has improved in recent games. Once a jet-heeled youngster on the path to a good career, injuries have reduced Appiah’s explosiveness, although he boasts an incredibly powerful shot that has really caught the eye in recent games. The other key dangermen for AFC Wimbledon are likely to be wide-men Andy Barcham and Mitch Pinnock. Barcham has consistently been a key player for the Dons over the past few seasons with his pace and dribbling ability beguiling opposition full-backs. Pinnock, a summer signing from National League Dover, has been in and out of the side, although his directness and delivery of the ball has established him as a key source of inspiration for the side. 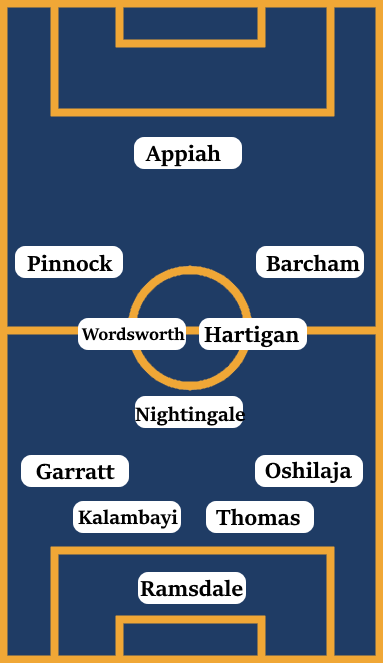 Downes’ key attempt to evolve the side at AFC Wimbledon has been in promoting more creative central midfielders in lower league stalwart and set-piece whizz Anthony Wordsworth alongside promising youngster Anthony Hartigan, while relegating the bruising duo of Liam Trotter and Tom Soares to back-up roles. Albeit, that injection of dynamism came with the caveat last week of playing centre-back Will Nightingale in midfield with them. Wally Downes’ task at AFC Wimbledon has been made difficult by injuries in defence robbing him of a key player in Deji Oshilaja in recent weeks. If the club captain can return to fitness, it will be a huge boost for a side that has been forced into handing a debut to the very raw young centre-back Paul Kalambayi in recent weeks, while key left-back Ben Purrington was recalled this week by Rotherham United to spend the rest of the season with Charlton. With a newly-signed goalkeeper between the sticks in Aaron Ramsdale, there could be an opportunity here to exploit a lack of understanding between AFC Wimbledon’s defenders. Although they are adrift at the bottom of the table, a point in this game would suit them fine at this stage of the season, so we may have to be prepared to break down a side happy to sit back against us. The key to this game could well be in staying patient and using AFC Wimbledon’s greater need for the points against them to exploit any lapses in concentration or confidence.